Your website is the most important component in your lead generation activity - and the first point at which your prospect truly meets your business. The more information you can acquire at this point, the more effective your website and marketing will become. will enable you to understand which keyword terms are generating traffic to your website, the pages attracting the majority of that traffic, why people visited certain pages and did not convert, and what devices people are using to browse your website. Having this information at your disposal will allow you to reshape your website to match the user experience. Perhaps most of your converted prospects visited your website via a mobile device? On that basis, optimising your pages further for the mobile experience would be beneficial. Or maybe you have a large number of returning visitors, some of whom have visited landing pages but not converted? With this information, you can analyse specific landing pages and ascertain just why those pages are failing to convert visitors. As it currently stands, 9% of websites online use Google Analytics to forensically track and monitor website activity. While a seemingly small number, when looked at proportionately in relation to the fact that there are more than 1.1 billion websites online, it is a significant amount. In terms of in-depth website analytics, Google Analytics is second to none. It provides your conversion ratios, email marketing performance, device sessions, traffic channels, campaign funnel, audience analytics metrics and much more. However, it can be incredibly hard to understand, especially if you do not have the time to immerse yourself in it. It’s filled with percentages, ratios, graphs, charts, signs, data sets, difficult navigation and other functions. All of which are incredibly useful, but you may just want to get a broad overview of the health and performance of your website, with stats on customer interaction and engagement. The screenshot below demonstrates the level of detail Google Analytics can achieve, including the numerous options you have available on the bar to the left. Of course, if you want to master the fundamentals of Google Analytics and begin on your path, SEOmoz’s guide to Overcoming the Google Analytics Learning Curve in 20 Minutes, is tremendously helpful. Evidently, using Google Analytics effectively is not easy. At the same time however, the more data you can acquire at the top of your sales funnel - i.e. at website level, the greater clarity you will have in regards to how people interact, or do not, with your website. This information will allow you to refine your website around buyer behaviour and generate more business over time. Therefore, with these variables and simplicity in mind, HubSpot has released a new beta feature called ‘HubSpot Web Analytics’, providing HubSpot customers with a powerful dashboard which delivers the most ‘pivotal’ top of the funnel metrics on an easy-to-use interface, helping you to assess the performance of your website. Currently, the HubSpot Web Analytics dashboard is in the beta phase, undergoing thorough testing. Even so, it comes with some tremendous analytical capabilities and requires no extra tools or tracking codes to work. It is currently available to Basic, Pro, and Enterprise HubSpot Marketing Portals. 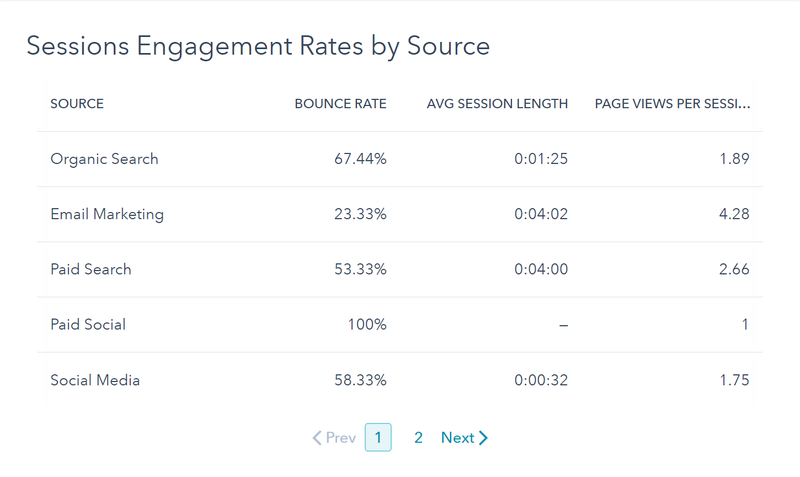 The new HubSpot Web Analytics dashboard gives marketers incredible insight into how people are engaging with their website - and how effective their website is at retaining those visitors. With this data, marketers can begin to refine their strategies. Perhaps the majority of their website traffic comes from mobile devices as opposed to desktops. Of course, in the mobile-first age we live in, that is hardly surprising; but it does offer marketers greater insight into what devices are being used to navigate their website – allowing them to optimise and restructure their website on that basis. Of course, as the HubSpot Web Analytics tool is in early beta testing, it will offer more sophisticated functions in the months to come. We suggest you stay tuned for an update blog! If you want to make the most out of your website's metrics, find out how we can help you with our bespoke reporting services.